Henrico County Recreation and Parks will present Red, White, and Lights, at Dorey Park, 2999 Darbytown Road, on Wednesday, July 4. 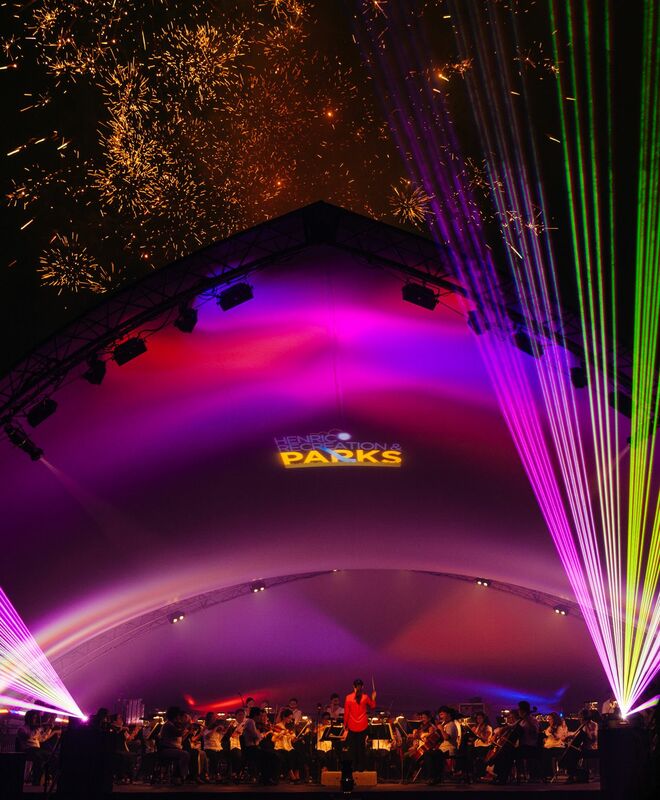 The free event begins at 5:00 p.m. and will feature the Richmond Symphony, family activities, musical entertainment, and a fireworks and laser-light show finale. Henrico County 4th of July Celebration has taken place annually since 1981, and this is the third year it has been held later in the day with a finale by the Richmond Symphony accompanied by a laser-light show. For 2018, the event is on the move to a new location and will include fireworks in the finale. The symphony will perform under The Big Tent, a state-of-the-art mobile stage that allows the orchestra to take its music out into the local communities; and this year they look forward to reaching a new community at Dorey Park. Guests are encouraged to bring blankets or chairs and arrive early to fully enjoy the event. Children and their families will enjoy contests and games, inflatables, an obstacle course, airbrush tattoos, Jonathan Austin, Miss Sheri the Clown, and Uncle Sam on Stilts, all in the Family Fun Zone from 5:00-8:00 p.m. The Afro-funk jazz group Plunky & Oneness will perform at 6:00 p.m. Emcee for the evening will be Kelli Lemon, RVA’s on-air personality for Radio One Richmond’s Kiss FM and iPower Richmond, and podcast host of Coffee with Strangers. 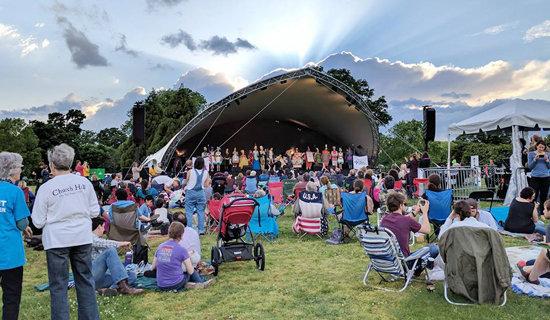 The Richmond Symphony will begin at 8:00 p.m. Food trucks will also be onsite to provide a meal or snack while guests enjoy the evening performances. Red, White, and Lights is sponsored by Henrico County and Genworth. For more information, go here. Kicking off its 60th Anniversary Season in September 2017, the Richmond Symphony is the largest performing arts organization in Central Virginia. The organization includes an orchestra of more than 70 professional musicians, the 150-voice Richmond Symphony Chorus and more than 260 students in the Richmond Symphony Youth Orchestra programs. Each season, more than 200,000 members of the community enjoy live concerts and radio broadcasts. The Symphony also provides educational outreach programs to over 55,000 students and teachers each year. The Symphony was recently named one of 21 American orchestras selected as a leader in orchestra innovation by the League of American Orchestras through its Futures Fund Initiative. The Richmond Symphony is partially funded by the Virginia Commission for the Arts and the National Endowment for the Arts.